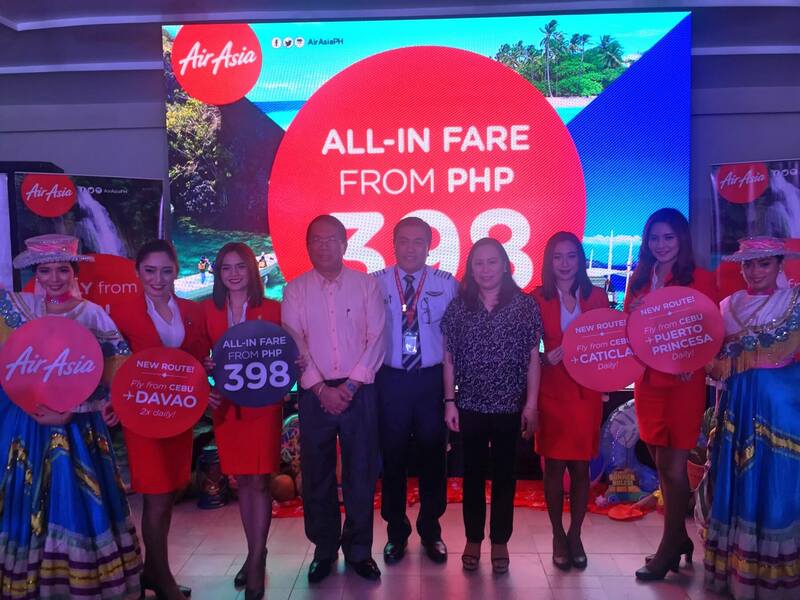 To help boost the country’s destinations in the Visayas and Mindanao, AirAsia will start Cebu and Davao flights to Palawan and Boracay through Caticlan on April 22, 2017 with one-way, all-in promo fares from as low as P398. The seat sale will be good for travel from April 22 to August 31, 2017 and also cover the reinstated Cebu-Davao-Cebu route as well as Davao-Clark flights. Captain Dexter Comendador, Philippines AirAsia chief executive officer, said the promotional seats are now available for booking at www.airasia.com and will run for one whole week starting Monday. NEW ROUTES, SUMMER PROMO. Captain Dexter Comendador, Philippines AirAsia chief executive officer, leads the launching of new routes from Cebu. With him are Department of Tourism Central Visayas Director Catalino Chan III (left) and GMCAC Head of Airline Marketing Aines Librodo. Starting April 22, AirAsia will have daily flights from Cebu to Boracay and Palawan and twice daily flights to Davao. From Davao, AirAsia will also fly thrice weekly to Boracay and Palawan and four times weekly to Clark. AirAsia also presented its latest destination campaign titled #ChasingWonders during the launching ceremonies held Monday, March 6, at Circa 1900 Casa Dos in Cebu City. It is intended to encourage travelers to visit and discover the many attractions of the Philippines. Comendador said the Cebu and Davao routes, increased flight frequency to Kuala Lumpur from Cebu, as well as the Cebu-Taipei and Cebu-Singapore flights launched last year are in line with the vision of AirAsia CEO Tony Fernandes to develop destinations outside of Manila and bring in tourists to the Philippines. ALL-IN PROMO FARE. AirAsia will start Cebu and Davao flights to Palawan and Boracay through Caticlan on April 22, 2017 with one-way, all-in promo fares from as low as P398. Since 2001 when Philippines AirAsia was established, it has been the company’s dream to make air travel more affordable and accessible for Filipinos. “With our newest routes, AirAsia would like to provide much-needed connections and tap into underserved markets, grow it, as there is definitely great tourism and business potentials in Visayas and Mindanao. We are thrilled to paint Cebu skied red,” he added.